When planning your next private charter flight to Madison, a safe bet would be to contact one of Charter Flight Groups travel consultants. Charter Flight Group has been in business for over 30 years because we do one thing and one thing very well…private air charters to destinations worldwide, including Madison. Some of the things that make us stand out among competitors are our record of safety, reliability, and professionalism. With countless flight destinations either domestic or international and the finest pilots in the industry, CFG can get you anywhere you need to be, 24/7. Every aircraft in the fleet is a luxury jet, which means that you, as a traveler or business executive are sure to get to Madison or wherever in comfort, relaxed and ready for what lies ahead. With the best private jets in the industry, including such names as Gulfstream, Boeing, Jetstream, Lear, Airbus, and Cessna, we can charter a private flight that is sure to meet your needs. To ensure such high standards of safety and performance, all private jets undergo rigorous maintenance schedules and must withstand not only FAA scrutiny, but also regular inspections by flight safety groups such as ARGUS and WYVERN. These two companies are brought in not only to help ensure compliance with regulations, but more importantly, to ensure that each of our jet flights operate smoothly, without incident. This ensures that our clients can sit back and enjoy their trip without concerns over safety or time-delays. Depending on your destination, there are two airfields in Madison that you can charter your private jet to land. Dane County Regional Airport is considered by some to be the best choice because of its close proximity to the heart of the city and U.S. Interstate highways 90, 39, and 94. Hence, regardless of where you need to be, your charter flight can get there quickly. By contrast, Blackhawk Airfield offers a more secluded and private airfield for those wishing to avoid crowds and attention. In any case, when you call one of our knowledgeable jet flight consultants, they can advise you on the best option should you wish. Blackhawk is located in the south-west area of Madison, outside of city limits and the city loop and for many, the scenery alone makes this a desirable airfield on which to land a private jet. Most private charter flights to Madison arrive for two reasons: Business or cheese. Sometimes, business AND cheese. Indeed, Wisconsin boasts that fully 25% of the entire cheese product made in America comes from that state and that is a lot of cheese. So whether you are there on business or pleasure, a visit to some of the many dairies and cheese manufacturers goes without saying. Be sure to ask your private flight specialist to include such a visit on your itinerary. 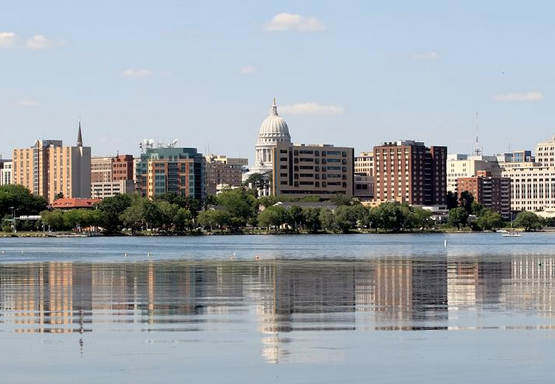 Of course, on the business side, Madison is home to several major manufacturers such as Kohler, Briggs & Stratton, and Johnson Controls to name a few. In addition, several major agricultural corporations are headquartered in Madison as are consumer goods manufacturers such as Epic Systems and Green Bay Paper. Naturally, visitors to Madison who charter a private jet flight for pleasure will be delighted to know that besides the cheese, Madison has a long and lively history. Some of the top attractions include the Chazen Museum of Art, the architectural wonder by Frank Lloyd Wright known as Taliesin, and the beautiful Olbrich Botanical Gardens. Be sure to have these added to your list of must sees when booking your jet charter flight. 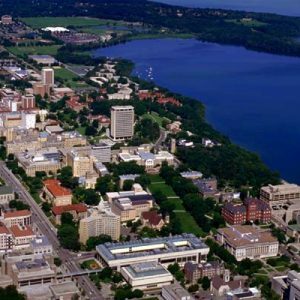 Why Fly With Charter Flight Group to Madison, Wisconsin? Of course, we understand that there are other companies you can choose when selecting an air charter jet flight. But here at CFG, we are rather biased about what we can provide for you during your journey. We know that we can get you there safely and in luxurious comfort. We also know that when you charter a private jet flight with us, you are going to be treated with dignity and respect. We also know that our private air charter specialists are going to ensure that everything is planned according to your rigorous specifications.The bottom line is we know that you will be so pleased with our private air charters that you will always call us in the future when you are ready to book your private jet. Give us a call. Isn’t it time you found out what we already know?